Attractive 18th Century map of the Russian Empire. Partie Occidentale de l'Empire de Russie, ou se trouve distinguee la Russie Europeenne, Divisee par ses Gouvernemens ou Provinces de Dwinskoy, Oloueckoy, Bielozerskoy, Archangel, Nowogrod, Wolockoy, Ustinskoy, Moscow, Kiowie, Bielogorod, Woroneskoy, et la Petite Tartarie, la Partie Asiatique Contient les Provinces Berezowskoy, Mangajeiskoy, Wiatka, Solkamskoy, Pelymskoy, Utimskoy, Tobolskoy, Surgutskoy, Jenifeiskoy, Narimskoy, Kuzneckoy, Tomskoy, Krasnojarskoy etc. le Royaume de Kasan, le Gouvernement d'Astrachan et les Confins du Royaume des Kalmaks Eleuths. Dressee d'apres les Cartes de l'Atlas Russien. 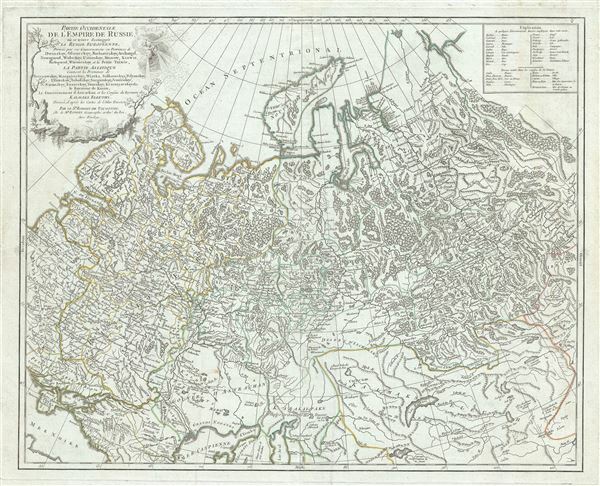 This is a beautiful example of Robert de Vaugondy's map of the Russian Empire or Western Russia. The map extends from Poland and the Baltic Sea eastward to Ilimskoy, Siberia and from the Caspian Sea north to Nouvelle Zembla and the Arctic. If offers excellent detail throughout showing mountains, rivers, forests, national boundaries, regional boundaries and cities. A beautifully engraved title cartouche adorns the top left quadrant of the map. This map was drawn by Robert de Vaugondy in 1750 and published in the 1757 issue of his Atlas Universal. The Atlas Universal was one of the first atlases based upon actual surveys. Therefore, this map is highly accurate (for the period) and has most contemporary town names correct. Very good. Minor wear along original fold lines. Print crease lower quadrants. Original platemark visible. Minor spotting and offsetting with damp stains near borders. Rumsey 3353.089. Pedley, Mary Sponberg Belle et Utile: The Work of the Robert de Vaugondy Family of Mapmakers, 405.